برهانی, رضا, احمدی گیوی, فرهنگ. (1397). تحلیل آماری- دینامیکی تاشدگی‌های وردایست منطقه جنوب‌غرب آسیا در سال‌های 2000 تا 2015. مجله ژئوفیزیک ایران, 12(2), 127-146. رضا برهانی; فرهنگ احمدی گیوی. "تحلیل آماری- دینامیکی تاشدگی‌های وردایست منطقه جنوب‌غرب آسیا در سال‌های 2000 تا 2015". مجله ژئوفیزیک ایران, 12, 2, 1397, 127-146. برهانی, رضا, احمدی گیوی, فرهنگ. (1397). 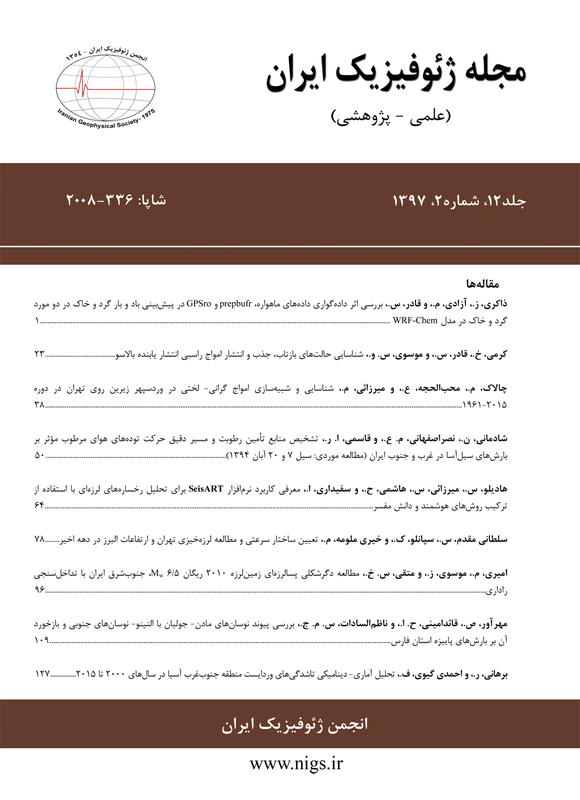 'تحلیل آماری- دینامیکی تاشدگی‌های وردایست منطقه جنوب‌غرب آسیا در سال‌های 2000 تا 2015', مجله ژئوفیزیک ایران, 12(2), pp. 127-146. برهانی, رضا, احمدی گیوی, فرهنگ. تحلیل آماری- دینامیکی تاشدگی‌های وردایست منطقه جنوب‌غرب آسیا در سال‌های 2000 تا 2015. مجله ژئوفیزیک ایران, 1397; 12(2): 127-146. این پژوهش با هدف بررسی آماری‌- دینامیکی تاشدگی وردایست در منطقه جنوب‌غرب آسیا بین سال­های 2000 تا 2015 انجام شده است. تاشدگی­های وردایست به کمک الگوریتم ارائه شده توسط شرلاک و همکاران (2014) و با استفاده از داده‌های میان‌یابی شده مدل IFS (Cy31r2) مربوط به ECMWF شناسایی شده­اند. سری زمانی انواع تاشدگی وردایست نشان می‌دهد که فراوانی تاشدگی در دوره مورد مطالعه روند افزایشی دارد. توزیع فصلی تاشدگی وردایست نیز بیانگر آن است که بیشترین میزان فراوانی تاشدگی در فصل تابستان و کمترین مقدار آن در پاییز وجود دارد. در فصل تابستان، تاشدگی‌های کم‌عمق و متوسط و در زمستان، تاشدگی‌های عمیق فراوانی نسبی بیشتری دارند. نتایج ضریب همبستگی بین میانگین ماهانه فراوانی تاشدگی و کمیت‌های دینامیکی، نشان‌دهنده تأثیر ناپایداری‌ کژفشار در تشکیل تاشدگی‌های زمستانه و تأثیر عوامل ترمودینامیکی در تاشدگی­های تابستانه است. برای بررسی دینامیکی تاشدگی در فصل زمستان، ماه‌های ژانویه 2001 و 2004 و در فصل تابستان، ماه‌های ژوئن 2007 و 2015 که به‌‌ترتیب کمترین و بیشترین فراوانی را در بین ماه­های متناظر داشتند، انتخاب و تحلیل شدند. بررسی شار افقی فعالیت موج تراز میانی وردسپهر در ژانویه 2004، همزمان با وجود یک چشمه موج قوی در غرب مدیترانه، وجود چاهه موجی را روی اروپا آشکار می‌سازد. در ژانویه 2001، شار فعالیت موج ضمن تضعیف به دو شاخه تقسیم شده که یکی از شاخه­ها در عرض‌های میانی و دیگری در جنب‌حاره است. مؤلفه استواسوی شاخه جنوبی، سبب انتقال انرژی موج به نواحی جنوب‌غرب آسیا شده است. قوی و ضعیف بودن چشمه­ها و چاهه­های فعالیت موج در این دو ماه را می­توان به‌ترتیب به فراوانی زیاد و کم تاشدگی وردایست مربوط دانست. در فصل تابستان، فعالیت موج عرض‌های میانی به‌شدت تضعیف شده است و همزمان با تقویت موسمی هند، در عرض‌های جنب‌حاره و روی اقیانوس هند، چشمه‌ها و چاهه‌های موج ضعیف‌تری شکل‌می‌گیرند. In general, the southwest Asia is one of the regions with positive anomalous values of tropopause folding frequency compared to the annual average of the northern hemisphere. The frequency of folding in this region in warm seasons is higher than in cold seasons. This research was carried out with the aim of statistical and dynamical analysis of the atmospheric processes associated with the tropopause folds in the southwest Asia during 2000–2015. Identification of tropopause folding is based on the algorithm developed by Sprenger et al. (2003) and Gray (2003) and refined by Škerlak et al. (2014). The detected folds are divided into three categories as shallow, medium, and deep based on their vertical extensions. The time series analysis of all types of tropopause folds shows that the frequency of folding events has an increasing trend during the period of study. The most frequent folding type is as shallow or medium in the summer season but as deep in the winter. The geographical distribution of the correlation coefficients between the monthly mean folding frequencies and some relevant dynamical quantities indicates that baroclinic instability mechanism plays the main role in the occurrences of tropopause foldings in the winter, while the effects of thermodynamic factors are dominant in the summer. Dynamical study of tropopause folds in both winter and summer seasons was conducted using January 2001 and 2004 as well as June 2007 and 2015 data sets. Results show that the winter tropopause foldings are associated with the formation of intense baroclinic waves in mid-levels of troposphere, strengthening of jet streams in upper levels and subsequently the formation of surface cyclones. Also, together with the seasonal displacement of the jet, the positions of tropopause folds are moving about 10 to 15 degrees latitudinally. The analysis of horizontal wave activity flux in January 2004, reveals the presence of a strong wave source (divergence of wave activity flux) in the Western Mediterranean and, at the same time, a wave sink (convergence of flux) over Europe. In January 2001, the wave activity flux was weakened and divided into two branches, one located in middle latitudes and the other in subtropical regions that transmitted wave energy to the southwest Asia. Furthermore, the strong equatorward wave propagation in this month indicates the anticyclonic wave breaking. In the two June months, as the baroclinic waves were weakened, the intensities of wave activity flux as well as the convergence and divergence centers in the southwest Asia were decreased compared to the January cases. Comparing the above results, it can be deduced that in winter, intense baroclinic wave packets in middle latitudes cause the strength of the subtropical jet, and consequently intensification of wave breaking which are associated with the occurrences of deep tropopause folds in the southwest Asia. In summer, the weakening of baroclinic activities leads to the reduction of deep folding frequency and the folds are formed mainly as shallow type at high levels. برهانی، ر.، احمدی گیوی، ف.، قادر، س. و محب الحجه، ع. ر.، 1396، مطالعه فراوانی و توزیع تاشدگی‌ وردایست و تغییرات فصلی آن در سال‌های 2015-2013 با تأکید بر منطقه جنوب‌غرب آسیا، مجله فیزیک زمین و فضا، پذیرفته شده در نوبت انتشار. Ahmadi-Givi, F., Nasr-Esfahany, M. A., and Mohebalhojeh, A. R., 2014, Interaction of North Atlantic baroclinic wave packets and the Mediterranean storm track: Quarterly Journal of the Royal Meteorological Society, 140, 754–765. Browning, K. A., and Reynolds, G. 1994 Diagnostic study of a narrow cold frontal rain band and severe winds associated with stratospheric intrusion: Quarterly Journal of the Royal Meterological Society, 120, 235-257. Bush, A. B. G., and Peltier, W. R., 1994, Tropopause folds and synoptic-scale baroclinic wave life cycles: Jouranl of the Atmospheric Sciences, 51, 1581–1604. Dee, D. P., Uppala, S. M., Simmons, A. J., Berrisford, P., Poli, P., Kobayashi, S., Andrae, U., Balmaseda, M. A., Balsamo, G., Bauer, P., Bechtold, P., Beljaars, A. C. M., van de Berg, L., Bidlot, J., Bormann, N., Delsol, C., Dragani, R., Fuentes, M., Geer, A. J., Haimberger, L., Healy, S. B., Hersbach, H., Hólm, E. V., Isaksen, L., Kållberg, P., Köhler, M., Matricardi, M., McNally, A. P., Monge-Sanz, B. M., Morcrette, J.-J., Park, B.-K., Peubey, C., de Rosnay, P., Tavolato, C., Thépaut, J.-N., and Vitart, F., 2011, The ERA-Interim reanalysis: configuration and performance of the data assimilation system: Quarterly Journal of the Royal Meteorological Society, 137(656), 553-597. Gray, S. L., 2003, A case study of stratosphere to troposphere transport: The role of convective transport and the sensitivity to model resolution: Journal of Geophysical Research., 108, 45–90. Griffiths, M., Thorpe, A. J., and Browning, K. A., 2000, Convective destabilization by a tropopause fold diagnosed using potential-vorticity inversion: Quarterly Journal of the Royal Meteorological Society, 126, 125–144. Holton, J. R., Haynes, P. H., McIntyre, M. E., Douglass, A. R., Rood, R. B., and Pfister, L., 1995, Stratosphere-troposphere exchange: Review of Geophysics, 33, 403–439. Hoskins, B. J., McIntyre, M. E., and Robertson, A. W., 1985, On the use and significance of isentropic potential vorticity maps: Quarterly Journal of the Royal Meterological Society., 111, 877–946. Kunz, A., Konopka, P., Müller, R. and Pan, L. L., 2011, Dynamical tropopause based on isentropic potential vorticity gradients: Journal of Geophysical Research, 116, D01110, doi:10.1029/2010JD014343. Nielsen-Gammon, J. W., 2001, A visualization of the global dynamic tropopause: American Meteorological Society, 82, 1151-1167. Plumb, R. A., 1985, On the three-dimensional propagation of stationary waves: Jouranl of the Atmospheric Sciences, 42, 217–229. Rezaeian, M., Mohebalhojeh, A. R., Ahmadi-Givi, F., and Nasr-Esfahany, M. A., 2016, A wave-activity view of the relation between the Mediterranean storm track and the North Atlantic Oscillation in winter: Quarterly Journal of the Royal Meteorological Society, 142, 1662–1671. Russel, A., Vaughan, G., and Norton, E. G., 2012, Large scale potential vorticity anomaly and deep convection: Quarterly Journal of the Royal Meteorological Society, 138, 1627–1639. Škerlak, B., Sprenger, M., and Wernli, H., 2014, A global climatology of stratosphere–troposphere exchange using the ERA-Interim data set from 1979 to 2011: Atmospheric Chemistry and Physics, 14, 913–937. Sprenger, M., Croci Maspoli, M., and Wernli, H., 2003, Tropopause folds and cross-tropopause exchange: A global investigation based upon ECMWF analyses for the time period March 2000 to February 2001: Journal of Geophysical Research, 108(D12), 8518. Thorncroft, C. D., Hoskins, B. J., and McIntyre, M. E., 1993, Two paradigms of baroclinic life cycle behavior: Quarterly Journal of the Royal Meterological Society, 119, 17–35. Thorpe, A. J., 1997, Attribution and its application to mesoscale structure associated with tropopause folds: Quarterly Journal of the Royal Meteorological Society, 123, 2377– 2399. Tyrlis, E., Lelieveld, J., and Steil, B., 2013, The summer circulation over the eastern Mediterranean and the Middle East: Influence of the South Asian Monsoon: Climate Dynamics, 40, 1103–1123. Tyrlis, E., Škerlak, B., Sprenger, M., Wernli, H., Zittis, G., and Lelieveld, J., 2014, On the linkage between the Asian summer monsoon and tropopause fold activity over the eastern Mediterranean and the Middle East: Journal of Geophysical Research., 119, 3202–3221. Uccellini, L. W., 1990, Processes contributing to the rapid development of extratropical cyclones, in Extratropical Cyclones. The Erik Palmén Memorial Volume, C. W., Newton and E. O., Holopainen: American Meteorological Society, 81–105. Vallis, G. K., 2006, Atmospheric and Oceanic Fluid Dynamics, Cambridge University Press, 745 pp. Wernli, H., Dirren, S., Liniger, M. A., and Zilling, M., 2002, Dynamical aspects of the life cycle of the winter storm “Lothar” (24–26 December 1999): Quarterly Journal of the Royal Meterological Society, 128, 405–429. Ziv, B., Saaroni, H., and Alpert, P., 2004, The factors governing the summer regime of the eastern Mediterranean: International Journal of Climatology, 24, 1859–1871.